Pre-commissioned prior to leaving the factory. 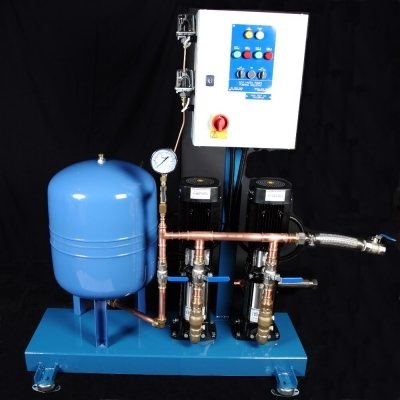 The New Haden Newpac booster systems consist of one to four pumps connected in parallel and mounted on a common base frame with all necessary fittings. Newpac is factory-tested and ready for operation on delivery. Newpac booster is supplied as a complete preassembled system mounted on a base frame. The only task left is to connect the pipes and the power supply. Newpac is a highly intelligent booster system which is capable of controlling one to four speed-controlled pumps in cascade. Newpac is one of our most simple booster systems to start up and operate. It has only two buttons for complete control of the system. The speed-controlled pumps are perfectly controlled and adjusted by the PI controller is protected inside the pump and this has proven to be a very reliable solution. All pumps that have an outlet-pressure sensor connected are capable of taking control of the entire booster system. This means that the system will continue to operate as a booster system even if one or more of the pumps or sensors are unavailable. Compared to systems with only one sensor, this makes Newpac an extremely reliable solution with a high level of redundancy. No system is more reliable than the weakest component. In connection with booster systems, it is common to rely on only one pressure measurement. However that makes the operation extremely dependent on one single sensor. We do not depend on one sensor (single point of failure) as the booster system is supplied with an outlet-pressure sensor for each pump. Before delivery, all Newpac systems are carefully tested i.e. pressure-tested and tested for full functionality. Newpac ensures low energy consumption through speed-controlled pumps, automatic cascade control of the pumps and highly efficient low-flow operation. The highly efficient motors and pumps also contribute to the overall high efficiency.